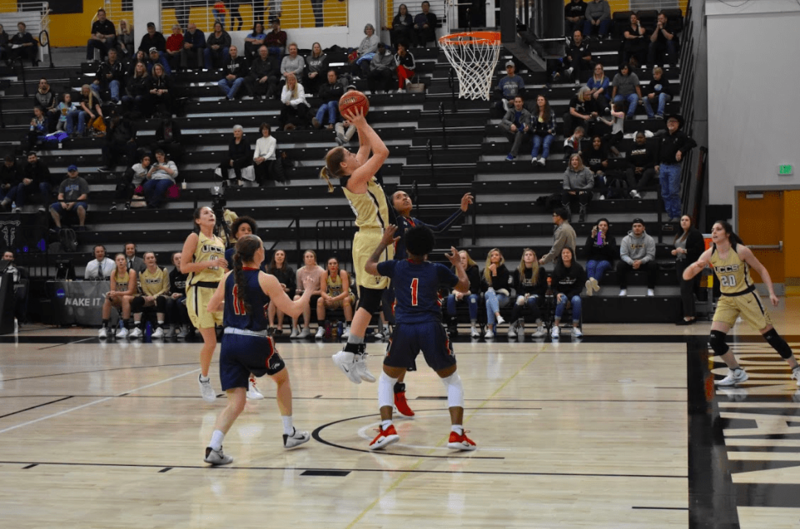 The UCCS men’s and women’s basketball teams hosted their final home games of the season against New Mexico Highlands University on Feb. 16. Women played first, winning 71-62 and the men won 94-83. On the women’s court, New Mexico scored first within the first few seconds of the game. The lead only lasted a minute, though, as UCCS drained a three-pointer to make the total score 5-4. UCCS held the lead for the duration of the game, leading by as much as 27 early in the fourth quarter. Most of UCCS’ points came from beyond the arc, as the Mountain Lions scored a total of 13 three-pointers throughout the game, with a 48.1 shooting percentage. Of those 13, ten came from junior Chelsea Pearson and sophomore Maddie Golla. The two guards made five 3-pointers each, accounting for 30 of UCCS’ 71 points. Thirty-two additional points came from the UCCS bench. Halftime featured a short scrimmage between two girls teams from the local YMCA in acknowledgement of the NBA All-Star Game that took place that same weekend. UCCS closed out the game with 22 points in the final two quarters, compared to 49 in the first two. In the fourth quarter, the Mountain Lions were held to only six points compared to New Mexico’s 20. Feb. 16 was also senior night for UCCS athletes, being the night of the final home games of the 2018-19 season. In honor of the departing seniors, a brief ceremony was held at center court in Gallogly Events Center. Seniors Kelly O’Flannigan, Emily Sert and graduate student Jae Ferrin were honored from the women’s team, receiving signed pictures, wreaths of red flowers and support from their teammates, friends and families. The men were honored next with Elijah Ross, Dalton Walker, Ian MacDonald and Brandon Malone, congratulating the men for their achievements, and they were thanked for their effort and dedication to UCCS basketball. Clyde the Mountain Lion, UCCS’ court-side mascot, was also honored for his service to the athletic program, since that night was his final performance at a UCCS basketball game. After three years of service, the student behind the mask will graduate in May. After the recognitions and accolades, the men took the court for their turn to face New Mexico. The UCCS men had played New Mexico on the road, and had lost by 33 points. This time, results were different, and the men won by 11. UCCS struck early, and held the lead until the second half when New Mexico gained a lead of two. That lead was short-lived, however, being shut down when junior Padiet Wang took off on a breakaway, dunking the ball to the sound of a cheering crowd. Wang was named the Rocky Mountain Athletic Conference (RMAC) Defensive Player of the Week for his performance for the third time this season. Tension early in the game led to a technical foul being given to UCCS Head Coach Jeff Culver. In the second half, however, with 4:49 left to play, New Mexico Head Coach Craig Snow was given a technical of his own. The decision brought in the loudest cheers of the night as the crowd celebrated. Then, with one minute left to play, New Mexico’s Gerad Davis, a senior, was also awarded a technical while seated on the bench. After the fouls, play resumed, and UCCS added eight unanswered points in the final minutes to secure the win. Both UCCS teams will finish their seasons this Friday, taking on the Colorado School of Mines on the road. The week of the 22-29 begins the RMAC tournament. At press time, the UCCS women were ranked No. 6 in the RMAC, and the men were ranked No. 4 If either team finishes the season ranked No. 4 or above, they will host the RMAC quarterfinals on March 5.